The Orchard Foundation is a nonprofit local education fund established as a resource for Central Louisiana that works with school districts, businesses, and communities to improve educational opportunities. We believe The Orchard Foundation provides outstanding opportunities to develop leaders in education which enhance the education efforts in Central Louisiana. 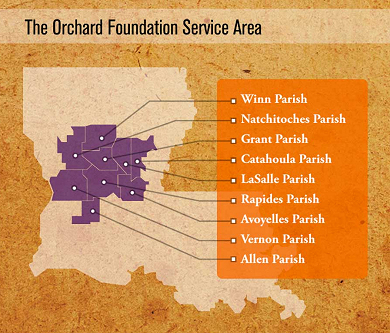 The Orchard Foundation serves a nine-parish area of Central Louisiana which includes: Allen, Avoyelles, Catahoula, Grant, LaSalle, Natchitoches, Rapides, Vernon and Winn. In 2004, The Rapides Foundation assembled a group of leaders from throughout the nine-parish Central Louisiana area to study the need for a local education fund and to determine the possible role it could play to improve educational opportunities for educators. The Rapides Foundation initially committed $600,000 over a three year period to establish the local education fund, and continues funding today under its Education Initiative. The Rapides Foundation’s Education Initiative seeks to increase the level of educational attainment and achievement among Central Louisiana residents. Research tells us that people with higher education levels are healthier and live longer. One of the core strategies in the Education Initiative is providing professional development and leadership opportunities for teachers and school leaders in Cenla. The Orchard Foundation administers these efforts through funding from The Rapides Foundation. Dr. Taylor is the Executive Director for The Orchard Foundation. She has more than 25 years of experience in the field of education, with the last 20 being in adult education, continuing education and workforce development. She holds a Bachelor of Science in Mathematics, Master of Education in Mathematics and a Doctor of Education from Delta State University in Cleveland, Miss. Prior to joining The Orchard Foundation, Dr. Taylor served as dean of the Louisiana Board of Regents Learning Center for Rapides Parish where she was responsible for directing operations of the facility and coordinating academic programs for more than 12 partner colleges and universities. Mrs. Cowley is the Central Louisiana Instructional Partnership Program (CLIP) Field Coordinator for The Orchard Foundation. She is primarily responsible for coordinating all field operations of CLIP. She holds a Bachelor of Science degree in Marketing from Louisiana Tech University and a Master of Business Administration from LSU at Shreveport. She also received her teacher certification in Elementary Education from Louisiana State University at Alexandria. Prior to joining The Orchard Foundation, she served as a teacher for the Rapides Parish School Board. In addition, Mrs. Cowley has several years of experience in advertisement, marketing and management. Mrs. Simpson is the Early Childhood Literacy Program Coordinator for The Orchard Foundation. She is responsible for designing and implementing the Early Childhood Literacy Program, as well as directing the work of the program's contracted literacy specialists. Mrs. Simpson holds a Bachelor of Science degree and a Master's degree in Elementary Education from Delta State University. Prior to joining The Orchard Foundation, Mrs. Simpson served as a classroom teacher at the lower elementary level throughout Mississippi. The Orchard Foundation's Mission is to improve academic achievement for Central Louisiana students by promoting best practices; recruiting, retaining, and rewarding excellent and innovative teachers; building school leadership; and strengthening school and community relationships. The Orchard Foundation functions as a resource which promotes leadership development for educators and higher achievement for students in Central Louisiana. The Rapides Foundation is committed to lawful and ethical behavior in all of its activities. Employees and trustees are required to conduct themselves in a manner that complies with all applicable laws and regulations.